This year, Abigail Anderson takes directing duties regularly held by the Theatre’s artistic director, John Terry. 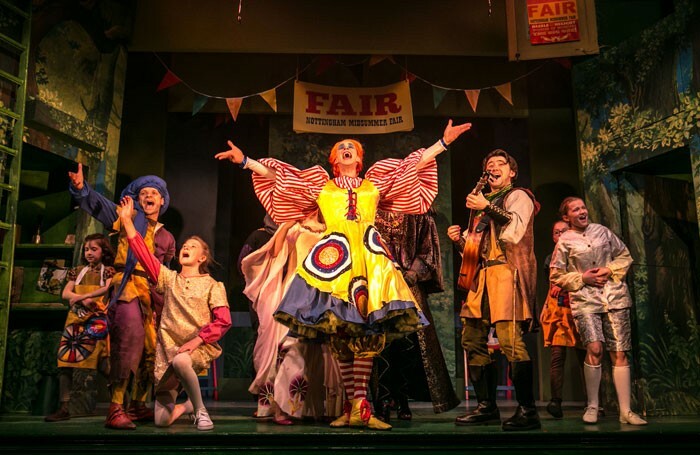 Anderson proves a fine addition to a merry band, delivering the characteristic panto panache audiences have come to expect from the venue. Ben Crocker’s script – overseen by Terry – is playfully knowing. Gags fly fast: jokes about tax credits, ‘posh panto’ and the infamous Chipping Norton set hit the target. The physical mischief is well-managed, with the audience assisting in hurtling a boulder to smash the Sheriff’s keep (and, thanks to Phillip D’Orleans’ fight direction, the Merry Men get to twirl weaponry in suitably impressive style). Under Sarah Travis’ musical direction, the songs are rousing and enjoyable, while designer Russell Craig has conjured a Sherwood Forest that looks like it comes straight from the pages of a lavishly illustrated children’s book, warmly illuminated by Christopher Nairne’s intimate lighting. There’s a welcome return for Andrew Piper, after nearly ten years away from Chipping Norton – his affably fiendish Sheriff of Nottingham is one of the highlights of a strong cast. Andrew Pepper makes a memorable dame, and Rosanna Lambe is an endearingly feisty Little Joan. Robin Hood is another strong effort – an imaginative pantomime that impresses as it entertains.